Our medical photo galleries are listed by subject on the right. Click on the links to see each gallery. All images are copyrighted, and may not be copied or modified without permission. You may link directly to these photos as long as the copyright notice is visible and is not obscured. All images are intended for use by health professions students and health professionals. For higher resolution or commercial use of these images please contact us. Listed below are high resolution photographs of patients with rheumatological disorders. 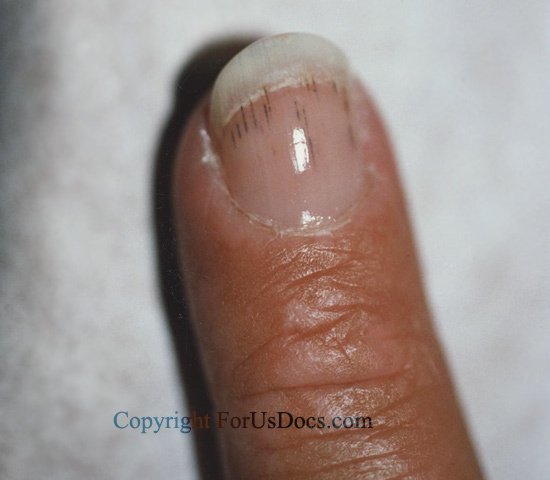 Scroll down to see patients with splinter hemorrhage from scleroderma, Hepatits c related cryoglobulinemia vasculitis, Gottron's plaques from dermatomyositis, nodular rheumatoid arthritis, Relapsing Polychondritis of the ear, Prominence of the temporal artery from Temporal Arteritis, and necrosis of the fingertips from antiphospholipid syndrome. All photos on this page are courtesy of Stephen Soloway MD. He is in private practice of rheumatology in Vineland New Jersey, (856) 794-9090. He has been consistently named as one of the top doctors in the Philadelphia area by Philadelphia magazine, the only doctor outside of Pennsylvania to achieve that honor in rheumatology. Castle Connolly has also recognized him as one of America’s Top Doctors, for several years in a row. 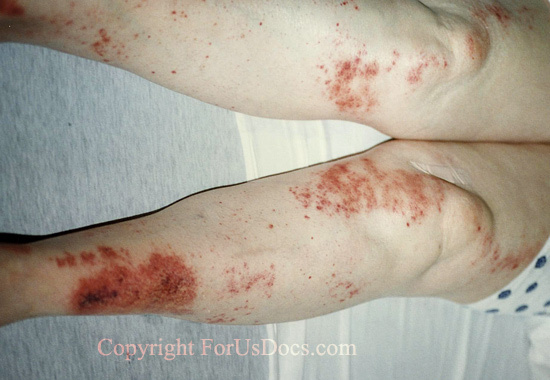 Cryoglobulinemia Vasculitis: Woman with hepatitis C with cryoglobulinemia, vasculitis, arthritis, and peripheral neuropathy. 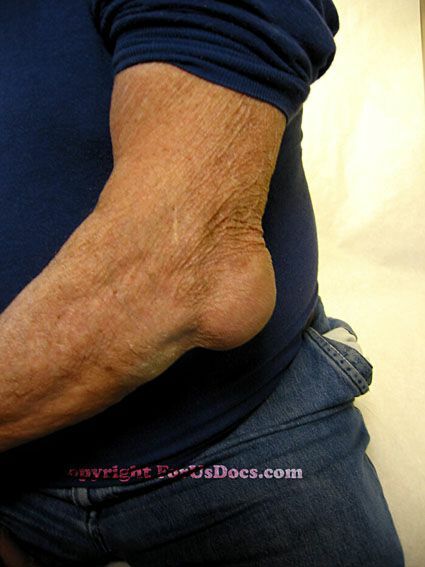 Nodular Rheumatoid Arthritis. 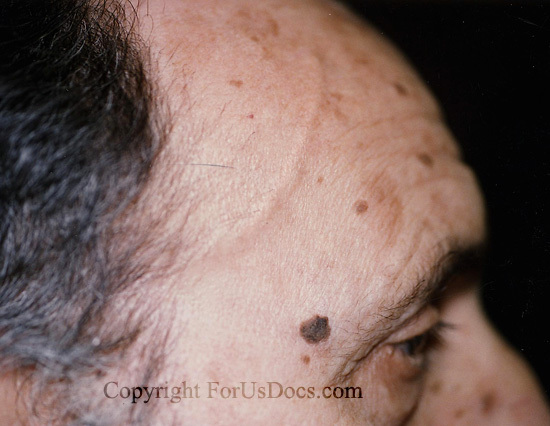 Cutaneous nodule at elbow as manifestation of nodular rheumatoid arthritis. 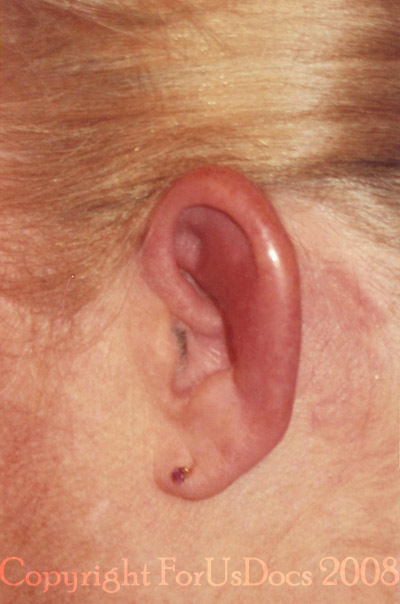 Relapsing Polychondritis: Woman with rheumatoid arthritis, positive ANCA (anti-neutrophil cytoplasmic antibodies), and repeated episodes of inflamed painful ear, with sparing of earlobe. Biopsy showed polychondritis. 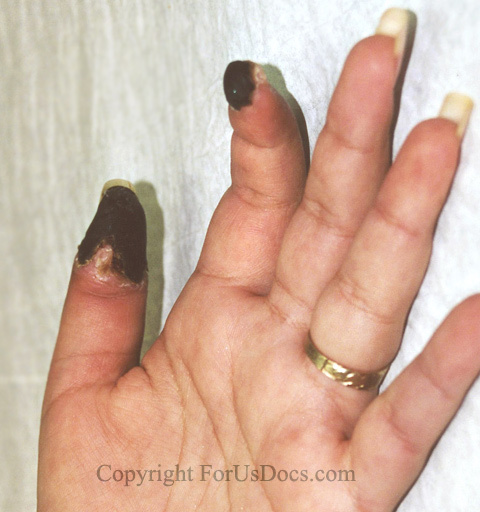 Antiphospholipid Antibody (Hughes') Syndrome: This syndrome is characterized by recurrent arterial or venous thrombotic events, such as in the fingers of this woman. It is associated with elevated titers of antiphospholipid antibodies such as lupus anticoagulant and anticardiolipin antibodies. Other names for this syndrome are APLA or APS syndrome.